Watch a trailer for CollegeHumor’s Bad Internet TV show, premiering on YouTube Red, Wednesday, May 25, 2016. The first season of this weekly sketch comedy series contains ten episodes. Bad Internet features a rotating ensemble cast of CollegeHumor and YouTube stars such including: iJustine, Rosanna Pansino, and Smosh. Other Bad Internet season one guest stars include Will Arnett, Jack McBrayer, Cheri Oteri, Jean Smart, and Oscar Nunez. 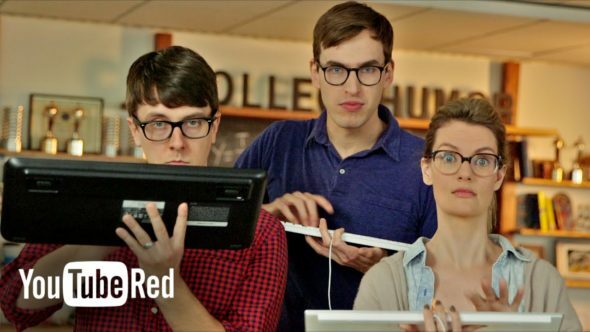 Watch the official Bad Internet TV series trailer from CollegeHumor. YouTube Red is a paid YouTube subscription. Members get ad-free exclusive access to premium content. YouTube Red is available in the United States. The service plans to expand internationally during 2016. In the US, go to YouTube.com/Red, to find out more about a free one-month trial of the new, paid video streaming service. Outside of the US, consult this chart. What did you think of the Bad Internet previews? Are you already a YouTube Red subscriber? Will you consider joining YouTube Red, to watch TV series like Bad Internet? Let us know, below. More about: Bad Internet, Bad Internet: canceled or renewed?, YouTube TV shows: canceled or renewed?